Our third stop of our 17 day tour of the Greek Islands was Santorini, a place at the very top of my travel bucket list. Given the amount of pictures I’ve seen on Instagram of Santorini, I’d safely assume it’s at the top of many bucket lists. Always admiring the images I saw, I’d be lying if I didn’t say I was excited to snap some Instagram worthy shots of my own (I am a millennial after all, sue me). Santorini is one of the many Greek Islands situated in the Aegean Sea. Once in the shape of a circle, the island now looks more like a crescent moon due to one the largest volcanic eruptions in world history over 3000 years ago. This eruption destroyed much of the island and left many smaller islands in its wake, including the inhabited and tourist popular Santorini, a smaller inhabited island by the name of Therasia, and numerous uninhabited islands. We arrived at the Athinios Port early in the morning. Upon our arrival, it quickly occurred to me that we were at the very bottom of what looked like a large mountain rising out of the sea. 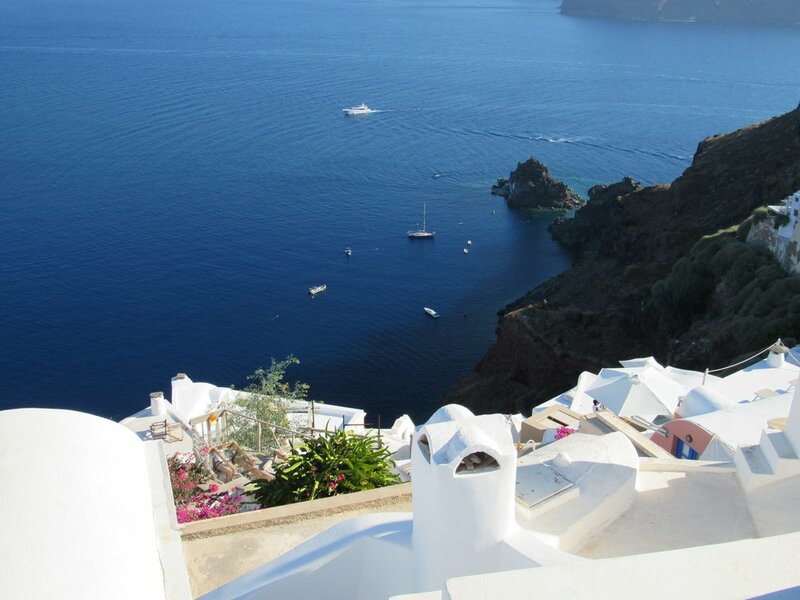 All the towns and villages of Santorini are located at the very top of this mountain-like island. I quickly asked our tour guide how we get to the top and he answered, “By bus, of course.” While I looked around and did see buses, the island looked like a giant wall that went straight up. Our tour guide must have noticed my confusion because he pointed to my left and said, “Over there.” As I scanned to my left, I finally noticed a road that looked straight from a cartoon: it was the definition of a zig zag but straight up. “Alrighty then,” I thought to myself. I guess the folks of Santorini really trust their bus drivers! Off we go! After a terrifying bus ride up the mountain, we headed to our hotel to drop off our bags and grab some lunch. Arguably the best hotel on our trip, we arrived at the Orizontes Hotel and made our way to our rooms. Each room was outfitted with a bedroom, living room, and balcony with incredible views of the southern part of the island. The island of Santorini has so much to offer and we were lucky enough to be able to experience much of it. Known for its beautiful villages, breathtaking views, and unbeatable sunsets, we kicked off our island tour with a stop at the island’s highest point, Profiti Elias. From here, you can see the entire island, including the smaller islands that were once connected prior to the volcanic eruption. A quick photo stop and we were back on the bus listening to our tour guide give us a brief history of Santorini as well as some fun facts, like that almost 1/3 of the women on the island are named Maria. A quick walk through a small village, we arrived at the Venetsanos Winery. Greece is famous for its wines, although it can be difficult to find Greek wines outside of Greece due to high import and export costs. The islands themselves, specifically Santorini, are famous for the Vinsanto wine, a sweet dessert wine, almost brown in color, with flavors of figs, raisins, and honey. I do have to admit, this was my least favorite offering we tried. It is very sweet. If you’re looking for a great Grecian wine, I highly suggest trying their Roses. It has a more berry tone and is redder in color than traditional “American” Roses. I’m not a big Rose fan here at home but I had a glass with every single meal in Greece. Finally, it was time to head to the place where the Instagram magic happens: Oia. Famous for its blue domes, and unbelievable sunsets, we spent our time in Oia enjoying a nice dinner, a quick stroll (filled with mini photoshoots), and finding the perfect spot to watch the sunset. Now, at this point in all my travels, I’ve seen a lot of sunsets, and most are overrated. But the sunsets in Greece, specifically Santorini, are truly the sunsets you write home about. Hope you enjoyed Part 1. Stayed tuned for Part 2, coming next week!